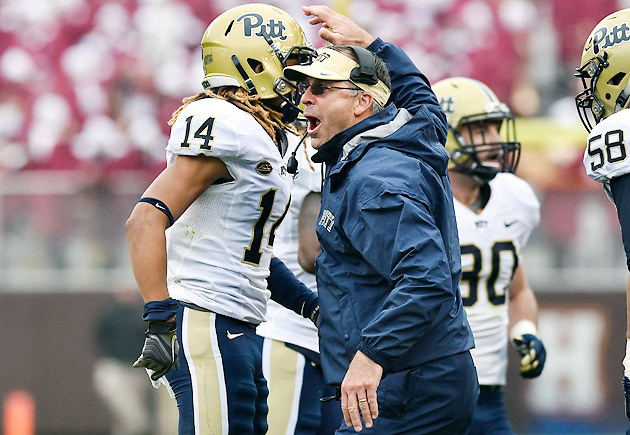 Pat Narduzzi has gotten off to a hot start at Pittsburgh on the field, with the Panthers at 6–1. Narduzzi is also winning in recruiting, including landing a coveted commitment from four-star safety Paris Ford. During his stint at Michigan State, Pat Narduzzi oversaw a series of dominant defenses. Between 2011 and ’13, he became one of the nation’s hottest head coaching candidates as the Spartans ranked no lower than sixth nationally in Football Outsiders’ defensive S&P Ratings and yards allowed per play. Despite his track record, when Narduzzi agreed to leave East Lansing for Pittsburgh in December, it was fair to question whether the Panthers would struggle defensively, at least in the first year of his tenure. Pitt finished 65th in the country in defensive S&P + last year and returned only six defensive starters. Thus far it appears that skepticism was unwarranted. Narduzzi has the Panthers locking down opponents—and top high school players are starting to take notice. Earlier this month Pitt received a commitment from Paris Ford, a two-way standout at Seton La-Salle Catholic High in Pittsburgh. Ford, a junior, won’t step on campus until more than a year from now, but that hardly detracts from the significance of his pledge. The No. 4 safety and No. 33 overall player in the class of 2017, according to Rivals.com, Ford lists scholarship offers from more than 15 programs, including Ohio State, Notre Dame and UCLA. He’d be a huge get for national contenders in any league, let alone an ACC outfit with a mediocre recent on-field track record. Ford says Pitt began recruiting him “hard” when Narduzzi arrived. The Steel City native took visits to other programs and says his decision ultimately came down to Ohio State, Notre Dame, Virginia Tech and the Panthers. Notre Dame had history on its side—Ford’s brother, Darrin Walls, now a New York Jets defensive back, played for the Irish from 2006 to ’10. And the Buckeyes’ College Football Playoff championship last season only strengthened their appeal to bluechip recruits. But according to Ford, Pitt recruited him more intently than other programs and made him feel as if he was a “special need.” Ford says he was “comfortable” with the coaching staff and adds that he didn’t want to go “too far from home” for college. Ford believes he could become a “big piece” for the Panthers and praised Narduzzi for his coaching acumen and the progress Pitt has shown under his charge so far. The Panthers are 6–1 this season, their only loss coming on a last-second field goal at Iowa. “He’s winning with the guys that aren’t even his players,” Ford says. A couple of weeks ago, Ford startled Damon Rosol, his coach at Seton La-Salle, with a phone call at 10 p.m. Rosol initially suspected something was wrong—“I said, ‘There’s nothing good that can come out of this conversation,’ thinking something happened to him the night before a game.” Instead, Ford was merely informing Rosol that he knew to which program he would commit. The next day, Oct. 16, Ford revealed his college decision on Twitter. Ford is the most highly rated player to pledge to Pitt in several years, but he doesn’t represent the program’s only recruiting win since Narduzzi took over. The Panthers held on to Jordan Whitehead, a top-100 prospect in the class of 2015 who pledged to Pitt under former coach Paul Chryst. Whitehead, the top prospect from Pennsylvania in last year, has made an immediate impact, leading all ACC freshmen in tackles. Among the top class of 2016 prospects who have pledged to Pitt are four-star receiver Ruben Flowers, three-star athlete Kaezon Pugh, three-star defensive back Therran Coleman and three-star linebacker Chase Pine. And there’s a good chance the Panthers will add more top-end talent, especially if they continue winning this season. But to land the top players who reside there, Pitt often will need to beat out Ohio State, Notre Dame, Penn State and Michigan. As shown in the chart below, the Panthers have not compiled elite talent at a rate conducive to conference or national contention over the last decade. Fortunately for Narduzzi, the ACC Coastal might be the most forgiving division in the Power Five. It’s on Pitt to take advantage by winning games. Pitt's record (including a 4–0 mark in the ACC) and No. 23 AP poll ranking—its highest since the preseason of 2010 (No. 15)—speak for themselves, and Narduzzi has sought to raise the Panthers' profile among recruits using social media. Though Ford is listed as a safety by three of the four major recruiting services, he has played several positions at Seton La-Salle, including linebacker and wide receiver, and potentially could make an impact on both sides of the ball with the Panthers. Ford, who likened the combination of himself and Whitehead to Seattle Seahawks safety tandem Kam Chancellor and Earl Thomas, says the Panthers were drawn to his versatility and physicality. “On my film, they say they like the way I come down to the box and hit,” he says. That suggests Ford would make a good fit for Narduzzi’s defensive scheme, in which safeties are positioned closer to the line of scrimmage than on other teams and often charged with helping out in run support. Ford could be a force in Narduzzi’s defense beginning in 2017. For now, his commitment is a testament to how winning—albeit in a relatively small sample size—can affect the ways in which a program resonates with top prospects. Convincing prospects of Ford’s caliber to buy in can only accelerate Pitt’s progress.